Hotel reservations system supplier Bookassist has announced today a full-featured location-aware booking application for Apple iPhone and mobile devices merging mobility and hotel sales for its hotel clients. The new application for hotels was announced as part of Bookassist’s annual presence at the FITUR international tourism trade fair in Madrid. Hotels across Scotland who are already using Bookassist booking systems can now offer a state-of-the-art application to their customers to complement their web presence. Location-aware mapping with automatic routing, customer reviews, photo galleries and full transaction engine for booking are among the key features of the new mobile system for hotels. Speaking at FITUR, Bookassist Head of Business and Operations Yahya Fetchati commented that “the new app will be customised for each individual hotel and will be available to all our hotel clients. As with all our products, our mobile platform will see continual development and upgrading to keep pace with the fast-moving mobile computing market”. Commenting on the features of the iPhone app, Bookassist CEO Dr Des O'Mahony said: "Social media plays a big part in the travel decision and customer reviews are particularly important. Because hotels using Bookassist software have been automatically collecting customer reviews for many years, and responding to their customers' comments, the new app will have significant value for the hotel\'s potential customers in terms of feeding all that customer-generated content right into the app for every hotel." 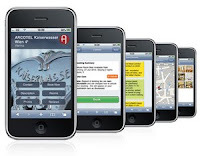 The mobile application is currently on limited release and will be more widely available to hotels and hotel groups using Bookassist's booking engine in March 2010. Bookassist® creates and manages successful and proven online strategies for over 2200 hotels and groups worldwide and is one of the fastest growing providers of online reservations fro accommodation providers of all sizes across Scotland. Ian McCaig from the Bookassist Scottish office based in Ayr was delighted with the news, "This is a really great innovation for our accommodation partners and we look forward to rolling it out with them early in the Spring."